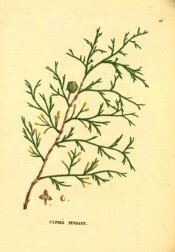 Hortus Camdenensis | Cupressus lusitanica Mill. Conical to columnar conifer with brown bark, shallowly fissured in spirals, with small blue-green leaves in spreading sprays, and spherical, shiny brown female cones, to 1.5cm across. To 20m. [RHSD, Hortus, Hilliers']. 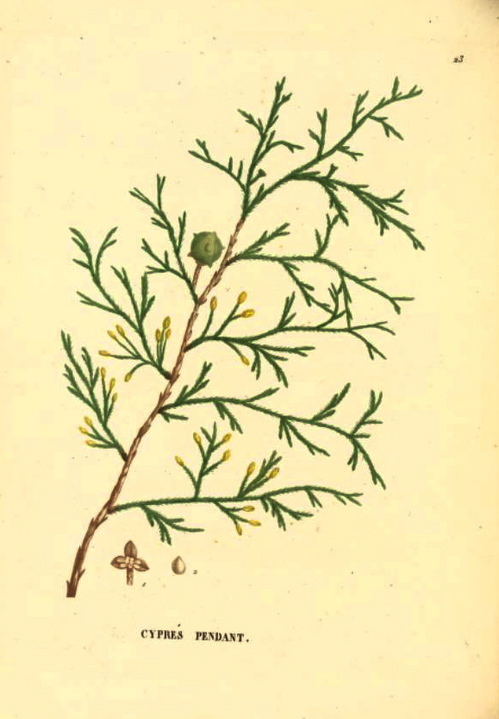 For many years the origin of Cupressus lusitanica, long known in Europe, was a mystery. Known to English gardens since at least 1684, Philip Miller mistakenly believed it to be from Portugal and named it lusitanica. The origin of this error appears to be the existence of a large stand of mature trees in Portugal, probably introduced by Spanish missionaries soon after colonisation of the Americas. The common name ‘Cedar of Goa’ suggests it was once planted in that colony by Portuguese settlers. [BM t.9434/1936]. Saint-Hilaire Arb. pl.23/1824. Listed in he 1850 and 1857 catalogues [C.26/1850]. This is a less likely identification for Macarthur’s Cupressus pendula than Cupressus funebris Endl. which see. See also Cupressus lusitanica Mill. var. benthamii (Endl.) Carrière. Cupressus lindleyi Klotzsch ex End.